The American Bulldog, or Bully, is a strong and athletic dog that is commonly adopted for working or as a family protector. For this reason, many of the top names for males have a sporty or powerful theme that reflects their build and personality. Historical military figures, Greek gods, and sports teams are common sources from which to derive this type of name. Females hold a greater variety of names, but stronger choices like Athena and Xena are also semi-popular. Because the American Bulldog’s coat is typically white with patches of varying colors, names like Aspen and Blanco have become favorites. This list is made up of the most prominent American Bulldog names among owners today. Some of our pages will contain a subcategory. A subcategory is a slightly more specific grouping than the main topic of the page. For a subcategory, we will include a separated table of names and corresponding descriptions. An example of a subcategory of Red Dog Names would be 'Dog Names Inspired by Red Wines'. 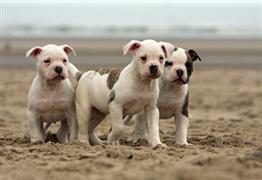 If you have any subcategory ideas for the American Bulldog Names page, we would love to hear them. Use the form below to submit your ideas.